Selling your home can make you feel powerless sometimes. You won’t be present to discuss all the great qualities of your listing with potential buyers. In fact, most of the time your realtor won’t be either. So in this sometimes challenging process, how can you feel more in control of how buyers see and experience your home? 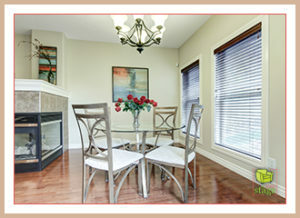 Here are some tips on staging your home to sell it. Staging can help you gain a better sense of control by presenting your property in a way that “speaks” to your buyers for you. Without a word, staging provides you with the power of influence. 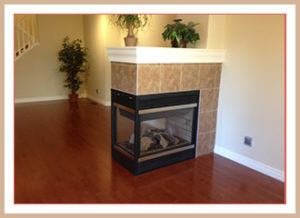 After: Enjoy the fireplace in this open concept living room/dining room/kitchen. Your influence is strongest when you approach your work with your realtor and certified home stager as a powerful team. Your realtor has knowledge about the market and what potential buyers are looking for in your neighbourhood. You have insider information about the special features of your home. And your stager is the marketing professional who bridges the gap between your property and your buyers by setting the stage for a perfect fit. Let’s say for example that buyers in your neighbourhood are looking for a landscaped backyard. You know that there is one specific spot in your home where the view of the yard is best. Your stager will intentionally stage that spot in a way that draws potential buyers out there, with a seat that’s waiting for them to capture the ideal view. And if there’s also a perfect spot to see that same view from inside, she’ll stage that too. 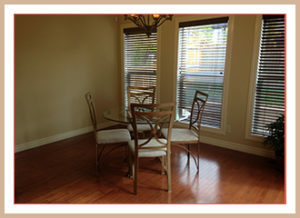 Before: Dining room before home staging. After: By adding artwork and accessories to the table already provided by the homeowner, this dining room is much more welcoming to invite buyers to see the lovely backyard. Communication, team work, and staging to sell allows you to have a voice, even when you and your realtor aren’t there to “make the pitch”. You don’t have to feel powerless in the selling process. Gain control, influence, and confidence by adding a professional stager to your home selling team. 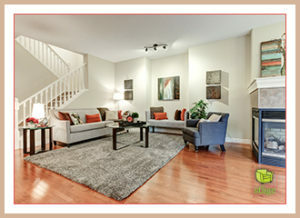 If you will be selling your Calgary property and have questions about how staging can help, I invite you to contact me to schedule your free, no pressure, personalized Home Staging Assessment today. This entry was posted on Sunday, November 27th, 2016 at 4:32 PM	and is filed under Before and After Home Staging. You can follow any responses to this entry through the RSS 2.0 feed. You can skip to the end and leave a response. Pinging is currently not allowed.